Help! OK so I booked our trip and currently have us staying at the art of animation resort which I have stayed at before and it is incredible as far as theming, however this is mostly an adult trip so I feel the added amenities might be best at a moderate resort so here’s my question do I stick with the family suite or do I go with two rooms in a moderate resort? Also, pricing wise I’m looking at Caribbean Beach resort or Coronado springs. I’ve only stayed in deluxe and value so I don’t have much experience with a moderate resorts. Any input and suggestions would be greatly appreciated! Reason I ask is that both CBR and CSR are in the midst of major construction and refurbishing until late next year. Is POR or POFQ out of budget? POFQ is especially popular with adults because its theming isn’t tremendously appealing to kids. We’ve never stayed there, but my DSis and DBIL did once and loved it. Very peaceful but with great entertainment available, they said. My Countdown Counting down to: Our Happiest Place for Mickey’s and my birthday—again! Happy Birthday, Mickey and me! My Previous Trips WDW 10/2017--VGF; WDW 12/2015--GF; WDW 11/2014--WL; WDW 11/2013--GF; WDW 1/2010--GF; WDW 7/2004--CR Tower /// DH to WDW several times in the 1970's & 1984; Me DL 1969. I wish POR or POFQ were in our price range. I have always wanted to stay at both. We will be traveling June 21-28 2019. We have stayed in a Junior Suite at CSR and thought it was nice. Its basically two connected rooms and one side has two beds (Queen?) and the other side had a sofa bed or a bed that pulled down from the wall. Its been a few years and can't remember for sure. We like CSR a lot and better than some of the deluxe resorts. Depending on when you go you will want to consider the construction at each resort. Both have major project underway. Yup, smack in the midst of massive construction at both as MichaelF indicated. Me, I’d stick with AOA unless dodging construction and possibly doing without some of those extra features that make a Mod more appealing won’t bother your group as much as it would me. I loved AOA. I would stay with that one. CSR is HUGE making it difficult to get to all the amenities, and requiring 5 bus stops. If you're using Disney transportation I think you are better with AOA. 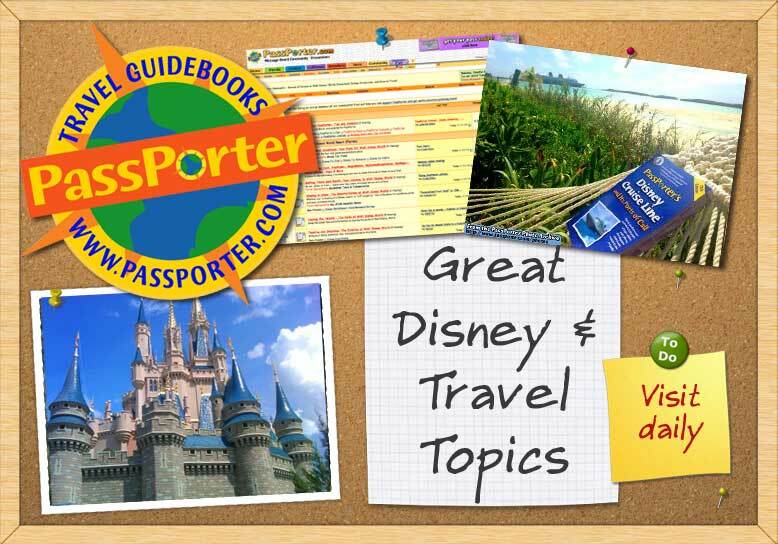 Learn all about the extremely popular Disney Vacation Club program at Walt Disney World; Disneyland; and around the world! Click here to see free sample pages from the e-book! Get this popular e-book free of extra charges when you join the PassPorter's Club for as little as $4.95. A club pass includes access to all our other e-books; e-worksheets; super-size photos; and more! This e-book is also available for separate purchase in the PassPorter Online Store for just $8.95. How many adults? The number of bathrooms could be a factor. Honestly I would probably choose CBR. I think you will be pleasantly surprised. I also think that you might possibly be able to score a summer discount for there where the suites are almost always excluded. With the construction not completely finished some people will be shying away making those rooms easier to book and modify by applying a discount when and if it becomes available. The number of bathrooms is definitely a factor. It looks like the majority of the construction was announced as finished and operational this morning, and only construction on two buildings remains. I would do two rooms at CBR if the construction is finished as they say it should be. Two bathrooms and bigger rooms are a plus for me! My Previous Trips DLR 6/1976 & 3/1986. WDW offsite Sept. 1985, Jan. 1988, Dec/Jan 1990/91, July, 1999. Enough of the off-site stays! CBR June 2000; PO-R June 2002; POP, CBR and Daytona Beach June 2005; 40th b-day celebration PO-R & AKL, June 2006; POFQ, Daytona (to watch Stinky win Nationals!) and back to the Fish (Dolphin) 2007. There's also construction of the gondola station at Art as well. I would lean toward 2 rooms at CBR, especially if there is still some construction going on. The reason I say that is because CBR and CS have been the only mods offering many discounts lately. I am sure that is because of the construction at those two resorts. Although not my favorite resort, CBR is nice and I believe the food courts and restaurant are finished or soon will be.